The Home's Manager is responsible for ensuring that these procedures are implemented, doing so on a delegated basis via the home staff. The Manager will also undertake regular checks to ensure that procedures are being maintained and will report to the Line Manager any persistent or serious faults. If young people are likely to undertake food preparation or other work in kitchen, the Home Manager must ensure a Risk Assessment is undertaken and identified risks are suitably managed. The Registered Person should ensure children are provided with nutritious meals suitable for each child's needs, these include to avoiding any food which the child maybe allergic to. Children should be involved in choosing and preparing meals and there should be opportunities for all staff and children to sit together to eat. Home's Managers must keep a record of menus (as served) demonstrating provision of a suitable and varied diet. Children may not be routinely excluded from communal meals, if a child is excluded, an alternative meal should be provided; any exclusion is deemed to be a Sanction and should be recorded as such. All care staff are expected to undertake mandatory training in Hygiene and Food Handling as part of their induction process and in all cases must have completed this course within six months of commencing employment. Knowledge of how to maintain hygiene of food preparation areas using appropriate cleaning products and how to ensure that chopping boards, knives and other implements are kept separate for tasks relating to different kinds of food items as appropriate to the levels required in a domestic setting. Where staff fail to observe any of the elements described above after having completed this training, this will be treated as a competency issue. Young people are helped to understand the importance of hygiene and food handling as part of the process of preparing them for independence. As part of fire training, staff will be made aware of the special hazards that kitchen fires present. Dates on food checked weekly or when product is used, whichever is the sooner. 'Use by' dates are found on perishable foods (such as fresh meat and poultry, salads, dairy products etc) and refer to the date before which the product can be safely eaten. It's illegal for shops to sell products that are past their 'Use by' date as they may pose a health hazard if they are eaten. Some products marked with a 'Use by' date may be frozen after purchase and then used within a specific period of time. It's important to read and follow the freezing instructions on these products very carefully. 'Sell by' and 'Display until' dates are used by shops to help with stock control and are intended as instructions for the shop staff, not the consumer. These dates aren't a legal requirement and products can be sold legally if they have gone past their 'Sell by' or 'Display until' dates as long as they are still within their 'Use by' or 'Best before' date. Green Salad and fruit only. Brown Raw vegetables, definitely those grown within the soil. White Bread and dairy products such as cheese. 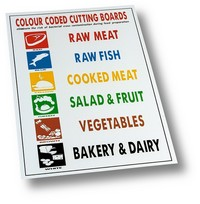 While colour coding is a first defence line for good food hygiene, it is still good practice for a board to be washed in hot water and sanitised when a different food product of a similar type is being cut up on it. This is very important with raw meat products since chicken needs thorough cooking, but beef steaks cut on the same chopping board might be cooked rarer. Knives with the same plastic colour coding in the handle should also be used to further reduce the likelihood of any cross contamination. Frozen food is defrosted in the fridge prior to use. Within food preparation area, guidance on the correct handling and preparation of food is displayed prominently. This must include storage temperatures and hygiene requirements. All staff involved in the purchase handling and preparation of food must have undertaken the Basic Food Hygiene Training. Controlling food temperatures is one of the most important things that must be done in the kitchen. You must ensure that food is cooked, cooled, chilled and reheated properly to minimise the risk of harmful levels of bacteria in the food. Remember that meat isn't the only high risk food. Dried goods such as rice and pulses and vegetable and salads may contain bacteria that may grow if bad temperature control is practiced. Always remember that perishable food should be kept out of the danger zone of 8°C-63°C to prevent the growth of harmful bacteria. In raw foods, such as meat, fruit and vegetables, there may be high levels of bacteria present due to contamination from soil or from processing in an abattoir. Bacteria are killed at high temperatures so it is important that food is cooked thoroughly to a core temperature of at least 75°C for at least two minutes. One way to check whether the food has been cooked thoroughly would be to use a probe thermometer. In all cases however, you must take care that probe thermometers do not contaminate or taint the food being probed. Make sure that probes are kept clean and disinfected before use with ready to eat food, otherwise the probed food must be discarded. Where antibacterial wipes are used, these must be suitable for use with food. Staff must keep a record of the temperatures of any high risk food prepared, in some instances it can be simpler to maintain a record for all main meals prepared. Whilst chilling food does not kill bacteria, it does stop it from growing to harmful levels. It is a legal requirement that perishable foods should be kept refrigerated at 8°C or below. Frozen food should ideally be keep at a temperature at or below -18°C. It is good practice to check and record fridge and freezer temperatures at least once per day. If a fridge or freezer cannot keep food below 8°C, it must be serviced or replaced. Each Fridge/freezer compartment should have its own thermometer to allow the daily recording of the temperature. Managers must ensure that records of temperature checks in maintained and appropriately stored. Records are helpful to show that the legal requirements have been met. It is good practice to keep all chilled food at 5°C or cooler. Note: Many domestic refrigerators may not achieve consistently the temperatures required by law, especially units that do NOT have fan assisted circulation or which are overloaded. Records should also make a note of action taken to remedy any discrepancies identified by routine monitoring. Separate basins for hand washing must be available together with soap and water and a means of hand drying. Towels should be of a type that is not reusable. The sink for equipment washing, may if necessary be used for food washing as well. It should be cleaned between uses and preferably disinfected. There should be space for drainage and drying. We welcome inspection, observation and comment, from a range of agencies including environmental health officers. The independent nature of their role often supports our efforts to promote further improvements in service delivery. To that end managers should contact Environmental Health prior to a residential home being opened to advise them that of the commencement of service and to request assistance and advice specific to that location. In addition officers may also come on a routine; usually unannounced visit or as a result of a complaint. The officer will also try to establish whether food is being handled and produced hygienically, is safe to eat, and that relevant temperature controls are being observed. The officer will identify any actual or potential breaches of food law and, if appropriate, gather and preserve evidence. What is the role of the enforcement officer? Sample food and arrange for microbiological testing. You can expect the officer to show identification and be polite throughout the visit. The officer will at the end of the inspection, discuss any contravention of food law discovered, any corrective action necessary, the timescale for corrective action, any further action the officer intends to take and any recommendations of best/good practice that the officer considers appropriate. In this closing discussion, and in subsequent reports or correspondence, the officer will clearly differentiate between actions required to comply with legal requirements and recommendations of good practice. In all kitchens, access to knives and any other sharp instruments needs to be controlled. Preferably they should be kept locked away with a method to account for each blade when not in use. Staff must ensure that children and young people are not placed at risk and are aware of hazards e.g. movement of hot pans, the use of oven gloves, proper storage of food, dangers of slippery floors, damaged electrical equipment and handling of knives. Use of the deep fat fryer is limited to staff that have had appropriate instruction on its use - (young people are allowed to use fryers). Slips from oil spillage; and strains and sprains from lifting and moving containers of oil. For fire safety and economy, fat fryers must always be switched off when unattended. Do not dispose of waste oil down the drain. Disposal must comply with environmental legislation. Clean up any spillages immediately. If you have a fryer at your location staff must have undertaken specific (or additional) training on how to deal with a fat fire. The design of microwave ovens ensures that the microwaves are contained within the oven and can only be present when the oven is switched on and the door is shut. However, microwave leakage could still occur around damaged dirty or modified microwave oven. It is therefore important that the oven is maintained in good condition and regularly inspected. The safety interlock devices fitted to the door work correctly. Never use the oven if the automatic safety switch (safety interlock) is not working. If the door or the case of the oven are damaged, either discard the device or have it checked for microwave leakage. Food and liquids heated in a microwave oven can become very hot; extra care must be taken when heating water to make hot drinks. To have a clean work place and provide a good image to customers. Sanitise or boil cleaning cloths at the end of each day. So why have cleaning schedule? Therefore in addition to a cleaning schedule template we have also included a Cleaning Monitoring Checklist. How is it going to be cleaned. Sweep & Mop Kitchen Floor Sweep the kitchen floor using broom, dustpan and brush. With a (green colour coded/labelled) mop and (green) mop bucket only to be used for the kitchen. Mop the floor using disinfectant and make sure "wet floor" sign is displayed. Sweeping and mopping should be undertaken at the end of each food preparation and cooking sessions. Where possible spills and dropped food items should be cleared up immediately. Duty staff (breakfast & supper time). Clean Work Surfaces Clean the kitchen work surfaces including chopping boards, using an antibacterial cleaner. Always wash worktops before you start preparing food. Wipe up any spilt food straight away. Always wash worktops thoroughly after they have been touched by raw meat, including poultry, or raw eggs. Never put ready-to-eat food, such as salad, bread or fruit, on a worktop or chopping board that has been touched by raw meat, unless you have washed it thoroughly first. Duty staff. Cook. Food rotation/Date Label Food Ensure 'Use By', 'Best Before' and 'Use First' dates label is placed on any food the day it is opened or stored. Discard any out of date produce. Daily as used or stored. Waking Night Staff (Daily Check). Check Food In Stores Check any fruit and vegetables for condition and discard as necessary. Check all other food in stores and discard any damaged or contaminated food. Preferably daily but this will depend on the type of food stored and the environment in which it is stored. Staff. Check Fridge/Freezer Temperature Record fridge/freezer temperatures once a day on the Fridge/freezer Probe chart. Fridge temperature range from 0 to 5 degrees C. Freezer temperature range from 18 to 23 degrees C. Once a day (ensuring that a record is maintained). Waking Night Staff (Daily Check and record). Clean All Fridges Remove all food from the fridge. Clean door seals/edges and visible hinges etc. General cleaning should be undertaken at least once a week. Clean Cooker Top Clean all surfaces thoroughly with detergent to remove grease. Immediately after use. Staff. Which cleaning materials should I use? Scourer - cleaning powders combining abrasive properties often with minute amounts of bleach. Can cause serious damage to enamel or stainless steel surfaces.